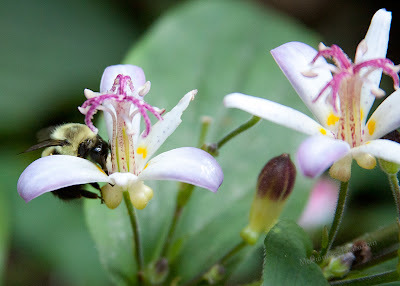 The bumblebee sips nectar from the toad lily. This dragonfly poses just long enough to have his photo taken. I've been fascinated by the flying creatures visiting my garden, more so than usual the last few days. There's the bees, which seem to be more plentiful this time of year. Maybe it's the type of flowers that are blooming now, such as the toad lilies or the sedum, that attract more bees than other flowers throughout the growing season. 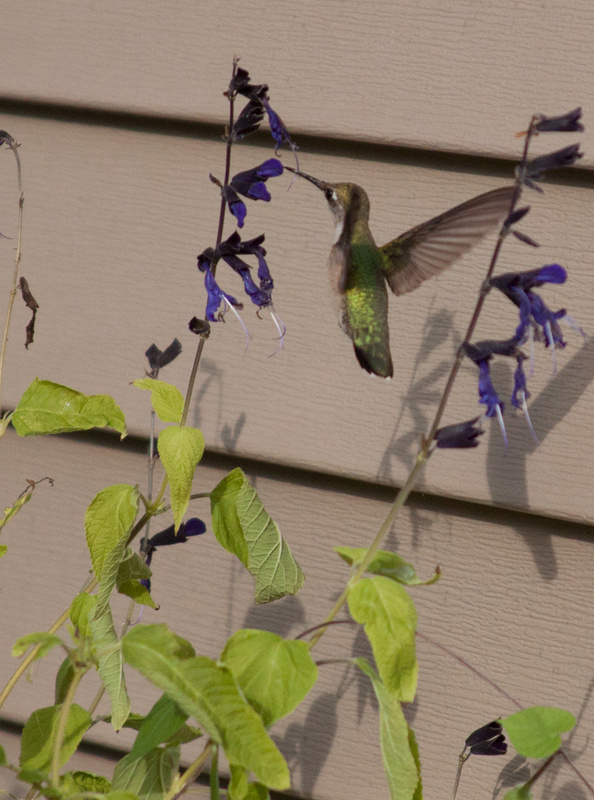 And there's also the recent steady appearance of the hummingbird that has really caught my attention. I was finally able to attract him and his mate to my feeder. (After trying on and off for two previous summers!) I'm really happy to have them in the yard, and I've been caught several times by my husband watching them from my kitchen window. 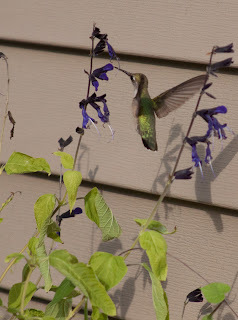 I was able to sneak a photo in of the hummingbird when he wasn't looking. Hopefully I'll have more opportunities to photograph him before he heads south this fall. Lastly, but not at all the least, is the dragonfly, which I hope is being fulfilled on a steady diet of mosquitoes. (We've had so much rain that every time I go outside they seem to be making a meal of me!) 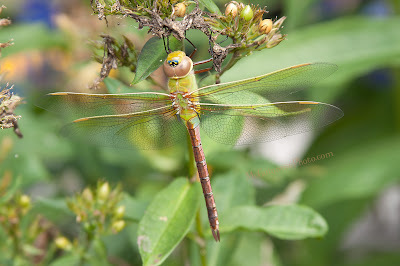 I've found the dragonflies to be the most patient to be photographed before they grow bored with me and fly off. In other news, we're having very unseasonable high temperatures in the 80s this week- it's not suppose to continue for much longer, though. I was able to sow seeds for peas, carrots and lettuce for my fall crops, so hopefully I've timed that correctly! I was also surprised to learn today that the "onions" I was trying to grow all summer were mislabeled at the garden center. I now have GIANT scallions. Blech!